This Friday, February 27, the Art and Politics of East Asia Workshop will welcome Hyunhee Park for discussion of a draft chapter from her dissertation project on wartime propaganda film. 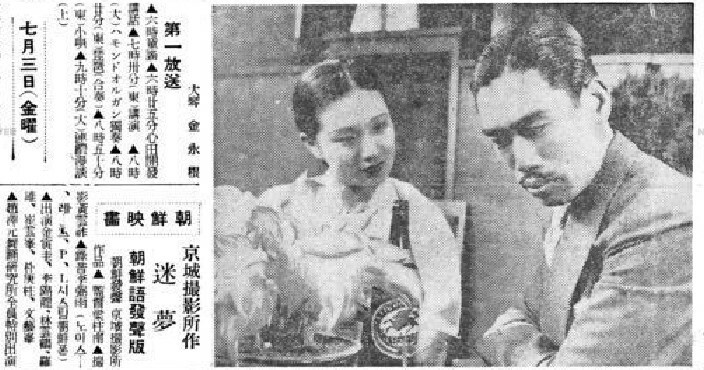 The chapter explores Sweet Dream (1936) as the earliest extant example of enlightenment film production in colonial Korea. Departing from existing scholarship that treats Sweet Dream as a New Woman story, the chapter interprets Sweet Dream as “traffic film,” part of an enlightenment film genre–unique to Korea within the Japanese empire–that inherently entailed sensationalism and “the aesthetics of astonishment.” The paper further argues that the state’s utilization of cinema to forward colonial projects had a large influence on Korean cinema from its inception, creating a mutually beneficial mode of production between Korean filmmakers and the colonial government. A draft of the paper is available at this link. If you have not received the password for the post, please feel free to contact Nicholas Lambrecht at lambrecht at uchicago.edu. Wine and light refreshments will be served at the workshop. We look forward to seeing you on Friday. This Friday, February 20, at 12:30 PM please join the Art and Politics of East Asia Workshop to discuss a paper by Chun-yen Chen, Associate Professor of English at National Taiwan Normal University. Professor Chen’s paper engages with conversations about the concept of mediation in current media theory and image studies by looking at the multimedia Glass Poetry initiative of an independent bookstore in a northern Taiwanese town; for further information, see this page or visit the rest of the 有河book website. A draft of the paper is available via this link. Please do not circulate or cite this paper without the author’s permission, and please note the special time of this presentation. Light refreshments will be served at the workshop. We look forward to seeing you on Friday!